Julian Fellowes has, as Hugh Bonneville puts it, ‘pulled a rabbit out of a hat’ and produced what must be my favourite season of Downton Abbey so far. While some of the acting can be criticised (I’m not sure about Michelle Dockery’s portrayal of a grieving widow, and Elizabeth McGovern’s Lady Grantham is very odd! ), the costumes and settings are divine, and there’s a good mix of drama, romance, intrigue, tragedy and humour to keep us entertained. It is 1922, and six months after the death of the heir to Downton, the Crawley family are still coming to terms with their loss and what it means for the future of the estate. The focus is very much on Lady Mary and how she is going to rebuild her life. Fortunately, she has the encouragement of Branson, Carson, the Dowager Duchess and a number of romantic suitors to bring her out of her shell. Lady Edith blossoms as she spends more and more time in Jazz-Age London, and new arrival Rose, the rebellious niece, keeps everyone on their toes. But of course, the drama isn’t just confined to upstairs – there are interesting things afoot downstairs as well. Just when we thought Bates and Anna were going to live happily ever after, there’s a dark twist in their tale. There’s rivalry among the kitchen maids, Mrs Patmore is struggling with the introduction of modern kitchen gadgets, and what does the ever-scheming Thomas have over Baxter, the new lady’s maid? 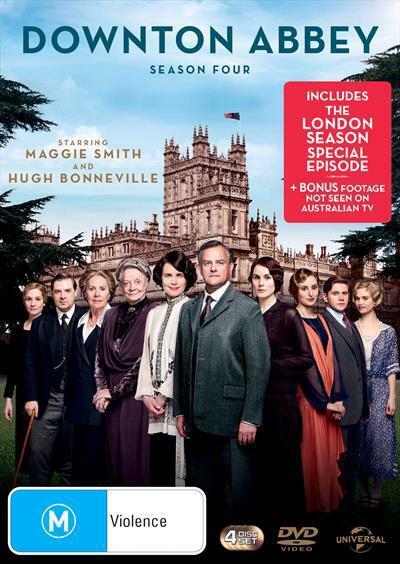 Included with Season 4 is the special feature-length episode ‘ The London Season ’, in which Shirley MacLaine returns as Lady Grantham’s mother – it’s always fun watching her spar with Maggie Smith’s Dowager Duchess. New characters and new storylines are developed this season, and the scene is definitely set for an interesting Season 5. Personally, I can’t wait!